Twitter just went through an awful 24-hour stretch. It included taking away a feature some people loved, probably being misleading about it, getting a huge amount of backlash, halfway bringing the feature back, and getting railed by the press for it all — with bouts of downtime mixed in for good measure. This is hardly the first time Twitter has had everyone up in arms, and it won’t be the last, but it’s pretty astonishing how the company seemed to solve one problem by creating two more. Sure, it’s easy to play desk-chair quarterback, and probably a bit unfair — but it’s also fun, and a good cautionary tale, so let’s do that. Problem 1: Twitter yanks the option to see @replies directed towards people you don’t follow. Why it was odd: Because it was just an option, and not the default setting. Users will never like options being taken away from them. Why remove an option? Well, we’ll get to that. 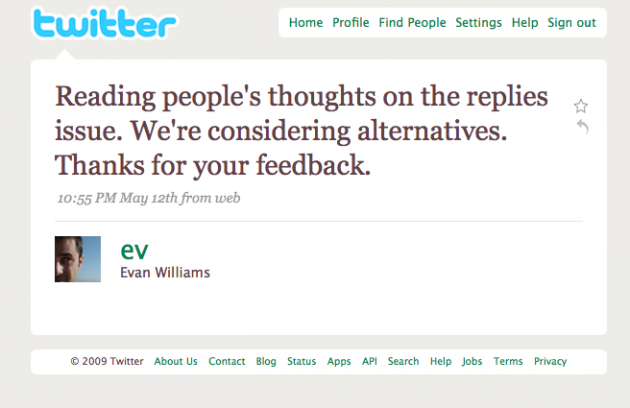 Problem 2: Twitter writes a blog post explaining that the change will “better reflect” how people use Twitter. It claims this is based on usage patterns and feedback. Why it was odd: Has Twitter learned nothing from Facebook over the past few years? If you’re going to make a change, even if you’re sure it’s the right one, let the users know before you do it. That’s true even if you have no intention of listening to feedback — which may also be the right play, more on that later. Problem 3: Prominent Twitter employees start tweeting about their distaste about the change. This includes tweets of uncertainty from CEO Evan Williams. Why it was odd: If you really are making what you think is the right call, don’t waffle — and especially don’t waffle on the service you created to let everyone see your thoughts in public. Users will pick up on this waffling, smell blood and go in for the kill. Why it was odd: This absolutely should have been in the first post on the matter. Hell, it should have been the key subject of the first post. Now it just seems like Twitter was being purposefully misleading about the reason it removed the option. I was at dinner the previous night discussing this change. Everyone at the table agreed it was clearly done for scaling purposes, if we all knew that, why did a co-founder of the company have to be “reminded” about it? He didn’t. It was just a mistake not to be honest about that upfront. Problem 5: Twitter goes down for its scheduled maintenance, the second such one during the middle of a work day, in a week. Why it was odd: Poor timing. Users wanted to discuss this new post and give feedback to Twitter via Twitter, but could not. Problem 6: Twitter follows up that second blog post with a third post just a few hours later saying it is halfway reverting the changes. Why it was odd: Halfway doing something is never a good idea. If you change something or don’t change something you will piss off some people, but if you half change something, you’ll piss off all those people. Problem 7: These changes appear that they will make the service much more complicated. Why it was odd: Keep it simple, stupid. That’s how Twitter was born, how it grew and why it is what it is. Twitter is trying to placate its users with these convoluted changes — that is just not a good idea in my book. Do or do not, there is no try. Problem 8: A server failed, making Twitter unusable for several hours. Why it was odd: Insult to injury. A bad day: It’s easy to play Monday morning quarterback, but it’s also no stretch to say that Twitter badly mishandled this situation. It’s not entirely clear if it was the very small percentage of users using the feature (3%, according to Twitter API lead Alex Payne), or if it was the taxing of Twitter’s servers that led to the decision of the removal. It was likely a combination of the two that was borne out of the latter. But that needed to be stated from the get go. Removing an option, no matter what percentage of users use it, generally doesn’t seem like a good idea. Those who do use it, clearly love it, and others probably like the idea of having that option as a safety blanket of sorts, just in case they ever want to use it. That’s not to say it can’t be done — but if you’re going to do it make sure you’re 100% committed to removing it. At the end of the day, the product is yours and you should be the ones making the call on which features stay and which ones go. It’s of course good to listen to your users, but most of them probably have no idea what they’re talking about when it comes to your product, so it should almost never go beyond listening. If it does — as it did today with Twitter — there’s clearly a problem. A plan that wasn’t thought through will lead to these types of days. Of course, Facebook has had plenty of these, as has Digg and so has Twitter (on a much smaller scale) — apparently, history repeats itself. Who knew? In terms of the actual feature removal, I’m up in the air about it. I kind of like the idea of simplifying my stream by removing @replies to users I don’t follow. I might miss that at first, but eventually I’d forget it was ever an option. At the same time, it is a good discovery tool — especially for new users. But what absolutely needs to happen is very clear to me: Twitter needs to either kill it completely or bring it back completely. When you start introducing conditional statements into the equation, it very quickly complicates things. That has never been what Twitter is about and should not be what it becomes about. As I said, it’s their product, but in my opinion, that would be a mistake. But what has me even more worried is the longer term second solution. You know, the new feature talked about in the third post that will give users “far more control over what they see from the accounts they follow.” That sounds a lot like the convoluted social tangle Facebook has created due to the privacy concerns of its users. As an asymmetric social network, Twitter shouldn’t have those issues. But there’s a potential ray of hope in this second solution: Filters. I want Twitter to keep the service simple and stay bare-bones, but it really needs a high level way to filter the people you follow. Yes, other services do this, but having it on Twitter actual could eliminate the concern about too much noise in @replies. It is working beautifully for FriendFeed, and is starting to work for Facebook. There’s a way to redeem yourself from today’s fiasco Twitter: Remove all data restrictions and simply give us filters. But maybe don’t listen to me — I’m just another user bitching, after all.